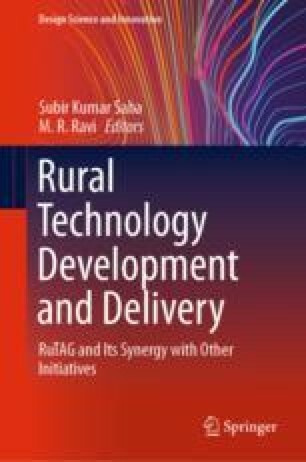 This paper intends to deliberate on the scope of future Rural Technology Action Group (RuTAG) projects and prescribes that the project scope for a technological solution to a demand-driven problem must include the design of technologies for its whole lifecycle and especially for dissemination. Principally at RuTAG, the satisfaction of the desired outcome has to be important than the design of the technology itself. Prevalent design, rather narrowly, refers planning and realization of the technology as Design. This paper argues that, for the final aim of scaling up the rural technologies to deliver the desired social good, designers must involve not only at improving the target technology, but also in design and developing the technologies that can support its successful lifecycle. This paper uses the case study of dissemination and successful adaptation of biomass cook stove. Astra Ole is an energy-efficient cook stove designed at Indian Institute of Science, India. Despite its successful dissemination for over three decades through government funding, the cook stove presented different challenges in dissemination. The dissemination of cook stove in frugal/open market settings demanded the design of manufacturing technology without compromising on the design of the original cook stove design. Design of the manufacturing technology proved to be the crucial contributor towards sustenance of the dissemination of the original technology. The Centre for Sustainable Technologies (CST), Indian Institute of Science funded this study. Ajeenkya DY Patil University provided the financial support for attending and presenting the work at the conference RTDD-2017.